This Secondary HDD Caddy Adapter For PATA (IDE)TO SATA. Caddy Interface:PATA(IDE). 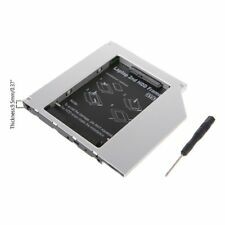 IDE TO SATA 2nd HDD Caddy Tray for 12.7mm CD DVD-ROM Optical Bay. 1 x 12.7mm SATA to IDE 2nd HDD SSD Hard Drive Caddy. 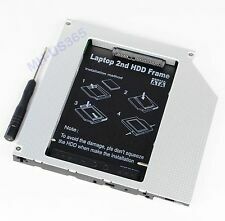 2nd HDD Caddy IDE To SATA 2.5" SSD Case For Laptop DVD/CD-ROM Optical Bay 12.7mm. 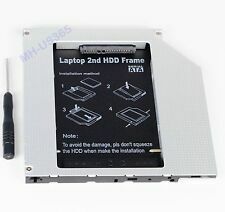 2ND Hard Disk Drive HDD caddy/adapter for any other Laptop that uses 12.7mm height DVD dirve with IDE connector to the motherboard. Interface: IDE(ODD)-SATA(HDD). And all the IDE drive interfaces (12.7mm) machine are applicable. Add a 2nd HDD to your laptop in place of optical drive. Quantity: 1 Set (other accessories demo in the picture is not included). Interface for Motherboard: PATA / IDE. The 2nd Optical Hard Disk Drive Caddy / Adapter to bring you new maximum data storage flexibility. With the second optical HDD/SSD caddy to swap your laptop DVD Drive, You can speed to backup important applications and critical data ( Simply remove your CD-ROM drive and put the Caddy (with the added hard drive) in its place. ). Interface: IDE(ODD)-SATA(HDD). And all the IDE drive interfaces (12.7mm) machine are applicable. 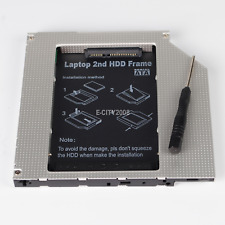 Add a 2nd HDD to your laptop in place of optical drive. Warm prompt Quantity: 1 Set (other accessories demo in the picture is not included). Laptop/ mother board interface: IDE / PATA. HDD Interface: SATA. Caddy Thickness: 9.5mm. 1 x Hard Drive 9.5mm Caddy. Fits for 9.5mm SATA interface hard drive. Due to the difference between different monitors, the picture may not reflect the actual color of the item. The 2nd Hard Disk Drive Optical bay Caddy / Adapter to bring you new maximum data storage flexibility. With the second HDD/SSD in your Laptop to swap optical drive, You can speed to backup important applications and critical data ( Simply remove your CD-ROM drive and put the Caddy (with the added hard drive) in its place;. ). For MacBook Pro A1181 A1260 A1150 A1211. Interface for motherboard: PATA / IDE. The 2nd Hard Disk Drive Optical bay Caddy / Adapter to bring you new maximum data storage flexibility. With the second HDD/SSD in your Laptop to swap optical drive, You can speed to backup important applications and critical data ( Simply remove your CD-ROM drive and put the Caddy (with the added hard drive) in its place;. ). 12.7mm PATA / IDE to SATA 2nd Hard Drive Caddy Adapter to Replace Laptop 12.7mm IDE Optical Drive CD / DVD-ROM. The PATA / IDE to SATA Caddy Adapter is for laptop / notebook which uses 12.7mm thick / high Optical Drive with PATA/IDE connector / interface. The PATA / IDE to SATA Caddy Adapter is for laptop / notebook which uses 9.5 mm thick / high Optical Drive with PATA/IDE connector / interface. ODD Interface: PATA / IDE. The 2nd Hard Disk Drive Caddy / Adapter to bring you new maximum data storage flexibility. Dell Precision M6300. 12.7mm PATA / IDE to SATA 2nd Hard Drive Caddy Adapter to Replace Laptop 12.7mm IDE Optical Drive CD / DVD-ROM. The PATA / IDE to SATA Caddy Adapter is for laptop / notebook which uses 12.7mm thick / high Optical Drive with PATA/IDE connector / interface. The PATA / IDE to SATA Caddy Adapter is for laptop / notebook which uses 12.7mm thick / high Optical Drive with PATA/IDE connector / interface. ODD Interface: PATA / IDE. The 2nd Hard Disk Drive Caddy / Adapter to bring you new maximum data storage flexibility. · Dell Inspiron 700m 710m;. Interface for motherboard: PATA / IDE. 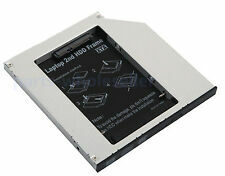 2nd 2.5 SSD HDD Caddy Adapter for Sony VGN-FW139E VGN-FW140E VGN-CR42S VGN-NR32M. Working with 2.5" up to 12.5mm (12.5mm/9mm/7mm or less) height SATA Hard drive HDD and SSD (Solid State Drive) as well. · Macbook Pro 15" A1260;. Interface for motherboard: PATA / IDE. Working with 2.5" up to 9.5mm / 7mm or less height SATA Hard drive HDD and SSD (Solid State Drive) as well. · The 2nd Hard Disk Drive Optical bay Caddy / Adapter to bring you new maximum data storage flexibility. Universal 2nd Hard Drive 12.7mm IDE-SATA Optical Caddy Adapter for Dell Inspiron 1501 640m 630M 6400 9300. Dell Inspiron 1501 640m 630M 6400 9300;. Interface for Motherboard: PATA / IDE. The 2nd Optical Hard Disk Drive Caddy / Adapter to bring you new maximum data storage flexibility. Universal 2nd 12.7mm IDE-SATA Hard Drive Optical bay Caddy Adapter for DELL PRECISION M6300 DV-28E dvd. DELL PRECISION M6300 DV-28E dvd;. Interface for motherboard:PATA / IDE. Any other accessories like Mounting Bracket or ejector latch will not included. Interface for motherboard:PATA / IDE. Any other accessories like Mounting Bracket or ejector latch will not included. 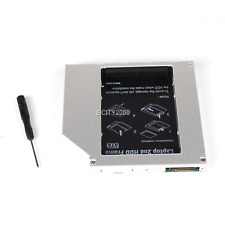 Universal 2nd 12.7mm IDE-SATA Hard Drive Optical bay Caddy Adapter for Apple iMac Early 2008. Universal 2.5" 9.5mm SATA to IDE PATA 2nd HDD Hard Drive Disk Caddy for Laptop CD/DVD Rom Optical Bay Asus/Dell/Lenovo/Samsung/Acer/Benq/MacBook Non-Unibody. Hard Disk Drive HDD is Not Included. Free Screws and Opening Tool. • HDD Interface: This device takes a SATA (2.5" sata HDD or SSD). • Tab Screw to keep the caddy aligned. • Laptop/ Mother Board Interface: SATA. 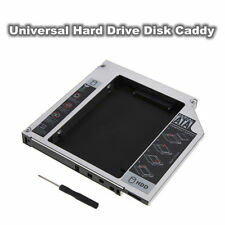 • 1 x 2nd HDD Hard Drive Caddy. • Adds a second hard disk drive to any modular bay. Universal 2nd 12.7mm IDE-SATA Hard Drive Optical bay Caddy Adapter for Dell Inspiron 700m 710m. Dell Inspiron 700m 710m;. Interface for motherboard:PATA / IDE. Any other accessories like Mounting Bracket or ejector latch will not included. 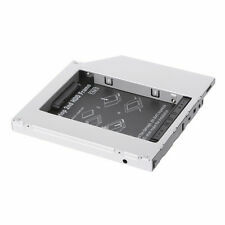 Universal 9.5mm PATA IDE to 2nd SATA HDD Hard Drive Disk Caddy Module New ! Interface for motherboard: PATA / IDE. The 2nd Hard Disk Drive Optical bay Caddy / Adapter to bring you new maximum data storage flexibility. With the second HDD/SSD in your Laptop to swap optical drive, You can speed to backup important applications and critical data ( Simply remove your CD-ROM drive and put the Caddy (with the added hard drive) in its place;. ). 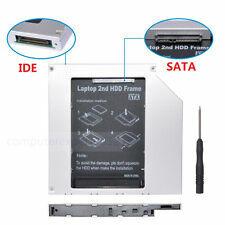 Universal 2nd 9.5mm IDE-SATA Hard Drive Optical bay Caddy Adapter for Macbook Pro 15" A1260. Macbook Pro 15" A1260;. Interface for motherboard:PATA / IDE. Working with 2.5" up to 9.5mm / 7mm or less height SATA Hard drive HDD and SSD (Solid State Drive) as well. Universal 2nd 12.7mm IDE-SATA Hard Drive Optical bay Caddy Adapter for HP DV2000 DV6000 DV9000. HP DV2000 DV6000 DV9000;. Interface for motherboard:PATA / IDE. Any other accessories like Mounting Bracket or ejector latch will not included. Interface for motherboard:PATA / IDE. Any other accessories like Mounting Bracket or ejector latch will not included. Working with 2.5" up to 12.5mm (12.5mm/9mm/7mm or less) height SATA Hard drive HDD and SSD (Solid State Drive) as well. 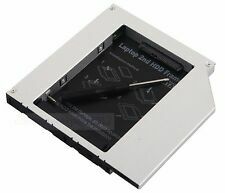 Universal 2nd 9.5mm IDE-SATA Hard Drive Optical Caddy Adapter for MacBook Pro A1181 A1260 A1261. 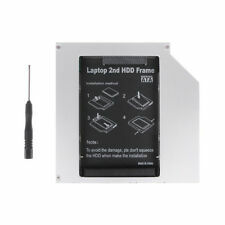 Compatible with:MacBook Pro A1181 A1260 A1261; Interface for motherboard: PATA / IDE.